Did you know that you can install and run WordPress on your Windows PC/Laptop.? If not, there is a way to do it.Almost all WordPress Developers who create Themes and Plugins install WordPress locally on their computer to test and work with it.And users like you can test Plugins/Themes and/or make changes on your site without making it live to visitors. Especially, If you are a beginner who is just getting started with WordPress, then you can easily learn and experiment various stuff in it. Here in this article, You will find How to Install and Setup WordPress locally on your Windows computer using WAMP. WAMP is a simple software that will let you create a Server environment on your Windows computer.You will need WAMP software in order to install and run WordPress on your computer as localhost.XAMPP is another alternative to WAMP specially developed for Windows platform. Firstly, Download the WAMP Server software from its official website by clicking on the link mentioned below. On the download page, you will see WAMP for different versions of Windows and architecture, Download one that is compatible with your device. Once the download is completed, simply open the Installer and follow the on-screen instructions to install it. Once the Installation is completed, Open WampServer. 2. Now phpMyAdmin settings will be opened in a new browser window.Click on “Databases” option in phpMyAdmin to create a new Database for WordPress installation.Choose a name for the database and simple click on the create button. 1. First of all, Download a fresh new updated copy of WordPress from WordPress.org. 2. The downloaded file will be in a zip format.Extract the Zip file and copy the WordPress folder. 4. Open any Web Browser and type the below given address in the Address bar. 5. Now WordPress will display a message telling that it cannot find a wp-config.php file.Simply click on the “Create a Configuration File” button to create a new one. 6. 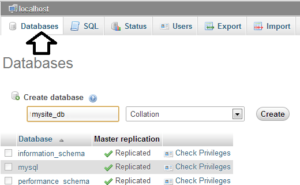 Now you need to provide your Database information that you created earlier.Type Database name. 7. Default username will be “root” and leave the password field as blank.Click on the Submit button and WordPress will create a new Configuration file. 8. Now you will see a screen saying that WordPress has successfully created the configuration file.Click on the “Run Install” button to continue installation. 9. 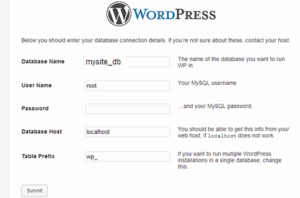 Now fill up your site details like Site Title, Admin Username and Password, Email and click on “Install WordPress” button. 10. Once the installation is completed, you will see a success message.Click on the login button to log in to your WordPress Admin Dashboard. Now you can use your new WordPress site like as usual in your PC.You can also run it offline, but for installing plugins and themes you must need an active internet connection. That’s it, We have successfully installed WordPress on our Windows computer with WAMP Software.This Installation will be great for newbies to get started with WordPress.The site you created will only be visible to you and no one can access it other than the administrator. Also Check: How To Setup AdSense Page-level Ads in WordPress & Blogger Blogs? Feel free to comment down below, if you face any problem throughout the article.